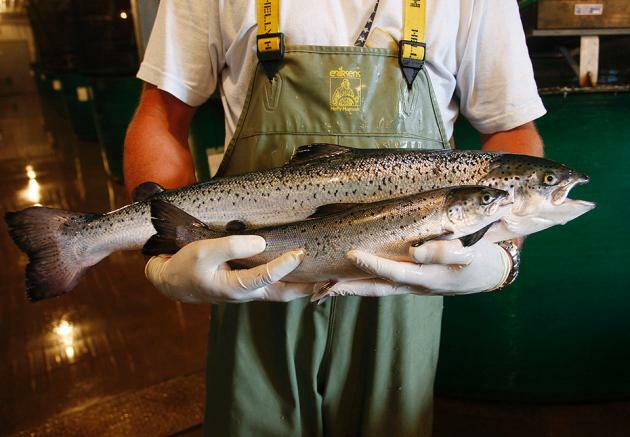 For the first time in history, a genetically engineered animal has been approved for human consumption: AquaBounty Technology’s salmon-creation, known as AquAdvantage. Its genetic makeup is comprised of components from three fish: base DNA from an Atlantic salmon; a growth gene from a Pacific Chinook salmon; and a promoter, and an ocean pout. Production of AquAdvantage starts on Prince Edward Island, Canada, where all-female eggs will be sterilized through a pressure treatment. They are then shipped to Panama to hatch, grow to maturity, and to be slaughtered before shipment back to the United States. Proponents and protestors both claim vast environmental, economic, or health benefits or harms; but one significant common dilemma these three nations share from introducing the “frankenfish” onto our dinner tables and in our markets lays within its environmental consequences. If AquAdvantage were to escape from the enclosures they are farmed in and into the oceans, wild fish populations would surely diminish—most notably, wild salmon. AquAdvantage salmon would outcompete their cousins for food and mates because they grow much larger and faster. Cross-breeding of AquAdvantage with wild species could mean a depletion of wild salmon populations, or even species extinction. AquAdvantage’s tolerance for much colder temperatures could allow them to spread to new territories and perhaps cause extinction of other species of fish. This outcome would have unforeseen consequences, but an intolerable impact on the natural processes of our ocean as well as an undecided future for humans would be certain. The question is how these countries will prevent this hazardous outcome and whether they are prepared for the aftermath.